Today’s the day. I’ve finally been defeated by technology. I signed up for Twitter for the same reasons I signed up for a Hotmail account back in ’97. Everyone else was doing it. Wow. E-Mail. I can get information on penile implants! And prescription drugs from Mexico! And Nigerian Internets Scams. Sweet! It's like regular mail. But it's HOT. Awesome! Can't believe I still have this account. Hit me up! Aliyaking@hotmail.com. I'll hit you back--eventually. HA. I wanted to get down with this newfangled “e-mail” my boy Anthony Emmanuel kept telling me was the future. I didn’t know who to send an email to. I looked around the computer lab and saw this cutie named Sango. I guessed that Sango’s email address was similar to mine and I sent him a message. We graduated a week or so later. I ended up on campus over the summer and checked my email account for kicks. And lo and behold, there was a single message–from Sango! Getting that email was like, a big deal. It was just an awkwardly phrased two-line response that had been sent through the air and magically appeared on the steel gray monitor in the computer lab. Felt like a miracle. Sango might as well have appeared inside my television set, waving and talking directly to me, like Mr. Furley in that movie Pleasantville. Between 1994, when I graduated from college, and 1997, when Hotmail was founded, I had no reason to have an email address. Hard to imagine, right? I remember asking a friend how to sign up for a free Hotmail account and he dismissed me: if you don’t have a computer, no reason to sign up for an email address. And of course I didn’t have my own computer. They were still just the big hulking boxes I used from time to time. By 1999, I had my own laptop. I worked at Billboard, seated at my own hulking beige desktop. And I had my very own email address. A few of them, actually. 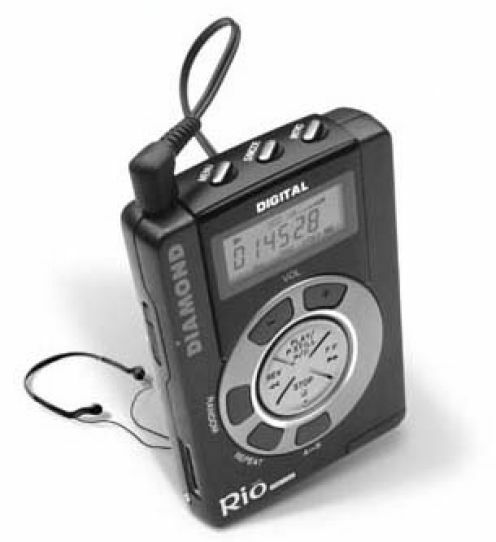 I read about this newfangled MP-3 device in a trade magazine that was published by one of Billboard’s sister mags. I wrote a story on the MP-3 format for The Source and the company sent me this player. Had no idea how to load music on the thing. Didn’t even know how to convert music files into digital files. I had to get the Tech Guy at Billboard to load some music on the player for me. He loaded exactly five songs just to test it out for me. For the entire life of that joint, I never had anything other than those five songs. Ha! And I used to listen to those same damn five songs on the walk from the N train to the offices at Times Square every morning. (My mother, on the other hand, refused to get a cell phone. Her reason? Why would I want to talk to someone on the phone while I’m out? Why can’t they just call me when I get home? She finally broke down and got a cell phone. And now she feels naked without it. But she STILL does not have Caller Id or Call Waiting on her home phone. Can you imagine?!?! I sometimes call and get a busy signal. Jeesh. I managed to collect two whole friends before I got bored with Friendster. But still. I was there. Got a classmates.com account. And realized I wasn’t particularly interested in reconnecting with high school friends that I couldn’t get to by email. 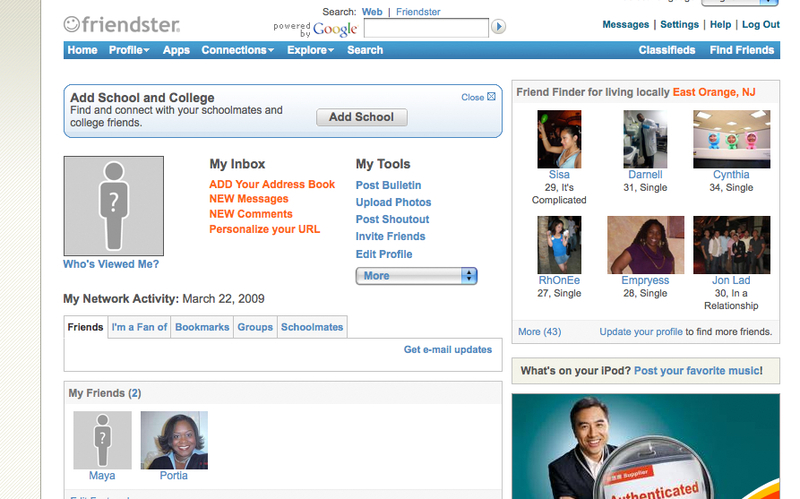 When myspace hit, I was not interested at all. But as a reporter, it quickly became very helpful. I can’t tell you how many times I have found an interview source on myspace or reached out to a not-too-famous celebrity and bypassed the whole PR machine. If you’re a writer and ever plan to do any kind of research, you have to be on myspace. Ugh. The myspace era is when I started to find myself fading. The pages take six months to load. The music is too loud. Everyone’s page seems to be slightly askew so it’s impossible to navigate the site properly. The whole thing gives me a headache. Too many entry points. Too many options. No clean white space. Just a big hot mess. And then Facebook came and saved the day. Social networking for grownups! I could keep up with Facebook. Even when my Inbox filled up quickly and navigating Friend Requests proved thorny. I even got over my fear of posting pictures online and began sharing photos here and there. I get Facebook. It makes sense to me. I tend to use it for more professional than personal reasons. But I get it on all levels. I even like the little community me and my 498 friends have established. Sidebar: I had 500 friends a few days ago. I only noticed because 500 is a nice, round number. And then just now, I looked up the number to write it in this post. And I only have 498. Alright, who deleted me?! Own up to it you little git! Hmph. 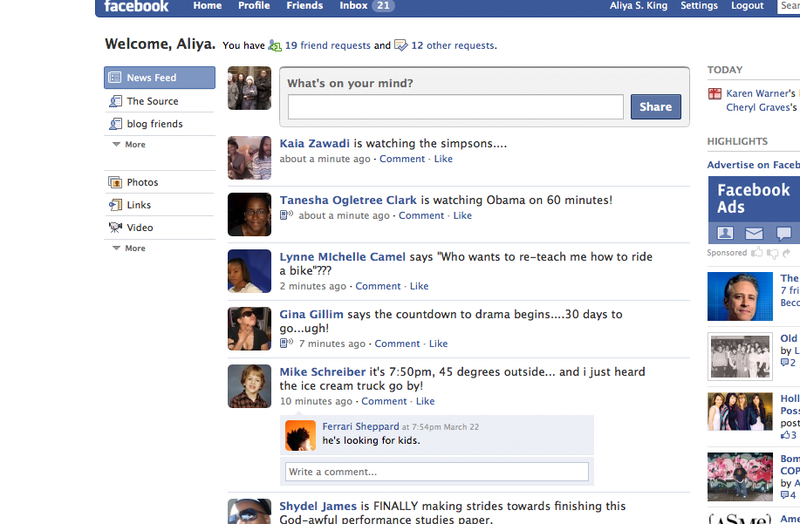 I can’t even complain about Facebook’s new redesign. Not crazy about it. But I’ll live. I dutifully signed up for Twitter. Because I’m a sheep and all the cool kids were doing it. For a while, like with all networking sites, I did nothing. I just watched. I didn’t follow anyone. And I didn’t accept anyone else’s request to follow me. I tend to take these things very slowly. Finally, I jumped in. I accepted the ten or so people who had asked to “follow” me, meaning subscribe to my updates. But what did I have to say? In 140 characters or less? I think it’s obvious that I tend to overwrite. A big reason why I started blogging was because I wanted the opportunity to run a four thousand word Q&A on a reformed hacker with no restraints. And now I had to communicate with 14o characters? Started following other people, mostly people that I already know. And I followed people who were following me. Signed on for Solange’s updates. And quickly stopped following her. She updated her Twitter status every thirty seconds. I felt like I was living with the girl. And she drowned out every one else I followed. The Twitterverse, (did I just make that up? Probably not), is moving way too fast. I don’t understand the slang. I just figured out RT. The constant pasting of links confuses me. I just see this ever moving line of one-liners and I. don’t. like. it. What’s wrong with me? Am I slow? Am I old? 1. Sometimes people reply to my Tweets long after I’ve logged off. When I log back on, I see an “LOL!! '” or a “You got that right Aliya! !” And I’m thinking to myself, what are they talking about? I don’t even remember what I said. How come you can’t see the entire thread of tweets?! Am I missing something? 2. What exactly am I supposed to be Tweeting? I follow a few people who update from bed, at every meal, at work… Some folks seem to just talk back and forth to each other. I don’t feel comfortable doing either. 3. I can’t access Twitter properly from my Blackberry. I can update my status. But I can’t reply to anyone. What am I doing wrong? Twittering is something I would do out on the road. If I had a quick, blog-like thought. But I can’t access it properly from my Blackberry. I went to a site called TwitterBerry and had no success there either. 4. Is it at all possible that I’ve finally come across a form of technology that’s just beyond me? The idea scares me. I want to stay up on everything til I’m old and senile. 5. Most importantly, since most of my Twitter followers are also my Dear Readers, what do you want from me on Twitter? I’m not going to tell you what I had for dinner. I can’t imagine you care that I went to Costco and racked up this morning. Or do you? How can I make Twitter more Aliyasking-y. A writer tip of the day, perhaps? A quote of the day from a great writer? Are you Twittering? Do you get it? Do you like it? Should I Twitter? This entry was posted on March 23, 2009 at 7:59 am and is filed under Random. You can follow any responses to this entry through the RSS 2.0 feed. You can leave a response, or trackback from your own site. Twitter might be useful if you’re looking for a lead, source, comment for a story, etc. I know a lot of p.r. folks use it for that purpose. Other than that, I don’t know. FB is the only social networking site I’m active on now. ironically i am following you on twitter. you’re right, i certainly don’t want to know what you had for dinner. i’m broke and chances are you are having what i’d like, i’m a vegetarian (are you…lol) and plus that’s just not hip to me….asking about your every move ya know. i follow you because in additon to being one of your dear readers, i’ve hit you up a few times on facebook asking for advice. when i use twitter on the go and happen to have a question for you, i can ask without having to log onto facebook. i even sent you a twit direct message. now facebook, i simply love it. i can connect with my folks from all over as well as establish connections for my writing. i am scared to think of the possibility of facebook being used for dating. i don’t want to know about that. however, i will say that once i created a facebook account, i let my myspace one go. as for hotmail…i let that go without deleting the account. its bad enough i am a victim of the nigerian scams and stuff with my yahoo, but hotmail was more junk mail than actual mail BUT i had the account in college because…like you said…it was cool! ***when you find out how to use it for your blackberry, please let me know. i am having a difficult time something serious. i must have been under a rock during the friendster movement? is that still up and running…what’s that like? Hey Aliya! Nope, you’re not too old or slow. Not at all. I’ve known about Twitter since it was founded in ’06 and still couldn’t get into it until last month. A co-worker of mine convinced me to join and since then I’ve found it to be quite an interesting peek into the lives of others, including yours. I’m following you now and I so get a kick outta being able to tweet back and forth. So if you post about going to Costco, I’ll read it, and if you decide to post about writing tips, quotes, interesting websites to visit, etc., that’s even better. IMO, Twitter is an extension of one’s blog and it can be a good way to gain new readers, connect with existing ones, as well as link up with other bloggers. I’m still learning the ropes myself, but so far, I can dig it. I’ve racked up 1300+ tweets so far and linked up with some really nice peeps. For me, it’s cool to learn what you, @danamo, @MimiValdesRyan, @nelsongeorge, @elliottwilson, and countless other editors/writers are up to. Not to mention some of these very same tweeters care enough to follow aspiring individuals such as myself. Oh yeah and thanks to your blog, I’ve learned about other writers such as @clovito, @nakedwithsocks, and @Chloe_Hilliard, who I enjoy following as well. It takes creativity to put ones’ personality into bite-sized 140-character morsels of information, even if it’s talking about what’s on TV or the breakfast/lunch/dinner plate. I think that’s what makes Twitter fun, but hey, whether you decide to tweet or not, your blog rocks regardless. I think Twitter is dangerous, too. I tend to forget that I have a large audience and say things I probably shouldn’t. I see myself getting off in the (near?) future, cuz even if you delete your tweets, those friggin web crawlers are saving it. Ugh. I use it to bring traffic to my site and promote the work I do that makes sure I’ll only have to strip part-time now. I initially didn’t get the point either, but I’ve been sucked in. Don’t leave it! I refuse to get Twitter because I don’t need another social meia site for me to keep up with a username/password, for my co-workers/parents to try to contact me, for me to get addicted to! I have to be productive at work and at home sometime. I must admit, my favorite love/hate celebrity, Diddy ALMOST got me to sign up. He was on Ellen talking about it, so I checked his page out, and it was pretty cool. But…no. I can’ t do it. It’s bad enough that you can connect Twitter to your Facebook account. TALK to me, dammit!! Twitter is the place where even the most mundane thoughts can be broadcasted to the world. I use it to have just shoot the breeze banter w/ my eFriends and to promote my blog. When looking for female bloggers for the Red Pump Project, Twitter was a GREAT tool as it became a viral movement and helped spread the word efficiently. I do my darndest not to post Tweets like “Dang it! I’m outta toilet paper” or “I just woke up.” Some folks really make Twitter their own version of EDTv, telling you EVERYTHING they have been doing from wake up to bedtime. I’d read whatever you Tweet Aliya. For 2 reasons. 1. Those that don’t Tweet like mad, when they finally Tweet, I pay attention. 2. You’re a great writer. Seeing your thoughts in 140 characters, Although challenging at times, could prove to be mad interesting. You need to follow way more people than you are currently, and vice versa for twitter to not seem pointless. The reason why solange has so many updates was really just because there was nobody updating in between. While you may not want to hear what I had for dinner you’d be surprised…some people – for example, people in this weight loss twitter group Im in – absolutely do. You have to remember that no two friends lists are the same and people have so many interests that youre not supposed to be concerned with every single tweet…its not all about or intended for YOU per se, ya know? If you want to figure out what replies that were sent to you while you were offline are in response to, just click on the little words “in reply to wisdombody” and it will show you which tweet theyre talkin about. For your blackberry, you need twitterberry. 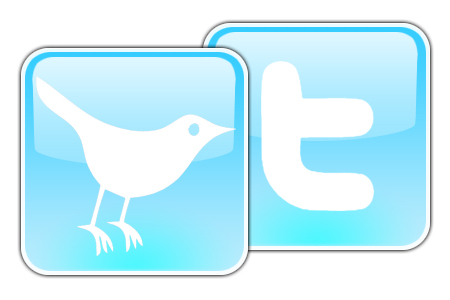 Just go to twitterberry.com and download the app, its pretty painless and very true to the full version of twitter. The constant tiny-linking is actually useful depending on who its from – I usually feed my blog through twitter and rack up a bunch more visitors than usual, and I have trusted sources for links as well – everyone from The BBC to other bloggers who may just be talkin’ trash. It doesn’t take too long to figure out whats quality and what’s not. I pretty much ignore everything else like the slang etc, until I’m forced to understand it. But that’s just how I am. I call myself a NIT-TWIT…cuz I’m on there, but damnit I dont get it! Hallelujah for this blog….I feel like I am NOT alone. I am on Twitter. ( http://twitter.com/tlawrites) I think I joined to finally be able to say I am “on” something since I don’t have a Facebook or Myspace page. (Technically, I do have a myspace page, but I only use it to find poeple/sources for writing) I use it to chat with a few folks here and there, but its also good info, depending on who you follow, to use as a writer. I find out things live and direct. Sometimes I enjoy reading the random thoughts of people who can articulate themselves in 140 characters without cutting off a word that is already short. It has made me chuckle and pass time in boring situations. I even “met” my writing partner on Twitter, so thus far no complaints. You can always hit un-follow when someones Twits just “irk your soul” with their random thoughts. Its brought more traffic to my blog page too. I keep getting nudged to join Facebook, but I think I am pretty good at keeping in touch with those I really want to keep in touch with. There aren’t too many names on my I wonder where they are now long lost friend list. I joined twitter a few months ago to follow a celeb’s updates that were protected (they shall remain nameless) and I love it. At first I didn’t know what to write but honestly, twitter helps me get through the day now, lol. I have a blog and it has helped to drive traffic to it but there are also people that I twit with and tweet about TV, movies, politics, and whatever topics may be of interest. I only know 2 of my followers/followees in “real life” and I actually prefer that bc I had family join FB and they are nosey as hell! My uncle has gone FB crazy and posts like he is a 15 yr old (and has sent emails to other members talking about status and page contents) so I needed somewhere were I could say whatever I wanted and not worry about some stupid reply, lol. FOLLOW YOUR DREAMS!!!! LET’S GO PEOPLE!!!! i’ll keep this under 140. I keep going back and forth with Twitter for as deciding whether or not Im going to join. I hate feeling im out of the loop but I also feel like okay what in the hell do I have to tweet about. Sometimes your life can be pretty mundane. The one thing I cant understand with Twitter and maybe somebody can answer this for me: Why do people “protect their updates” when all you have to do is NOT update? Am I missing something with that twitter function? @ozakie Protected Updates ion allows you to be selective about who sees what you type in an open forum. Its like being in line at the club and waiting to get picked to go beyond the velvet ropes. Being “accepted” to follow someone makes ya feel special if thats what it takes to make you feel special. It helps against spambots too which are of course also on Twitter. The fight against spam just seems impossible to win. @Thembi I didn’t know you could check which tweet someone is replying to by clicking that link. thanks! At the same time, I don’t think it’s for everyone. You have to be able to keep up with the updates, esp if you have a lot of followers. I installed TwitterFox, which works with the Firefox browser, soon after I signed up. it’s like an email notifier. You can set it to update every 3 minutes, 5 minutes, etc, instead of having to refresh your homepage constantly. Usually, I have my twitter moments where I’m on there for minutes at a time. but sometimes I don’t check it at all. It’s all up to you. 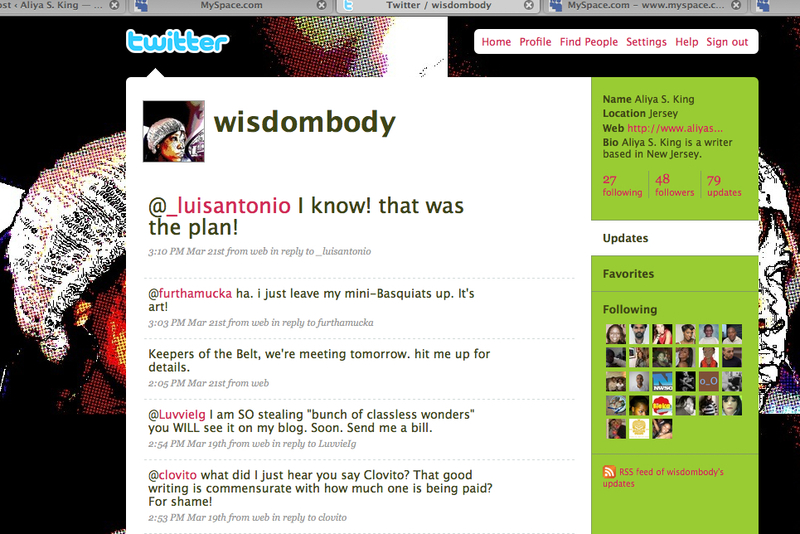 I also have twitterberry and it works perfectly fine. I love twitter! Talk about whatever u want to talk about. Whatever may be on your mind. The crazy outfit someone had on the train, your new pair of shoes, your horrible day, etc… It’s just like a big instant messenger to me. I tend to reply to all the funny stuff other people say. Most of the times ppl tweet about popular tv shows like The Game, Harlem Heights, & For the Love of Ray J. It’s like we’re all watching together. We play games sometimes. Rhymefest does the vs. game with different themes of the day. I can access it from my ipod using twitterfon, but it’s best at home. Twitterfon usually allows you to see the conversation btwn two people. I did notice that when ppl use other applications and reply to me it doesn’t have the replied to link under it. I have to go back on my page and figure it out myself. Twitter is for da birds. Why would I need to know 50 times a day what you are doing? Agree with the fact that I feel like I would be “living” with you. Besides, how many average everyday norma folks have time “tweet”? We actually have lives to live. Personally, I think its way for boring folks to feel important & for them to think that someone really cares about their life. Its great to follow celebrities…once again for boring folks. PS. I did sign up but quickly (within hours) realized it wasn’t my cup of tea. It took me awhile to understand it. Honestly, I didn’t even update until months later. I use Twitter because it helps me see what people are doing, thinking, feeling in real time. Although there’s a line between annoying and useful information, I’ve found awesome restaurants, exclusive concerts and good insight from social media experts without the hassle of people seeing all my pictures and what my friends are writing on my wall. There’s also none of that “friend me” business so it’s a broader audience. I also subscribe to local artists and larger ones like Ryan Leslie (and Diddy!). Sometimes he’ll post things about what he’s doing and where he’s at – stuff I can’t find looking on his site. It’s more personal, even if it is a marketing tactic. I check my “@ replies” often so I remember what was going on in the context of my convos, but although Twitter does take some getting used to, it can be kind of cool. Give it a month or so, if you hate, don’t worry – you’re not the only one! That line is from “Cross My Mind.” I reference it quite often! Love that song.